The classic V2 Yumbox lunchbox with exterior box and removable tray houses 6 compartments (with food group labelings and fun illustrations). 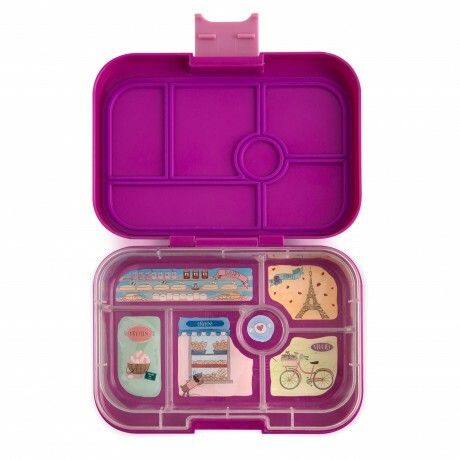 Balance & portion control: Yumbox's pre-portioned illustrated (and removable) tray guides you to pack a healthy and hassle-free lunch. 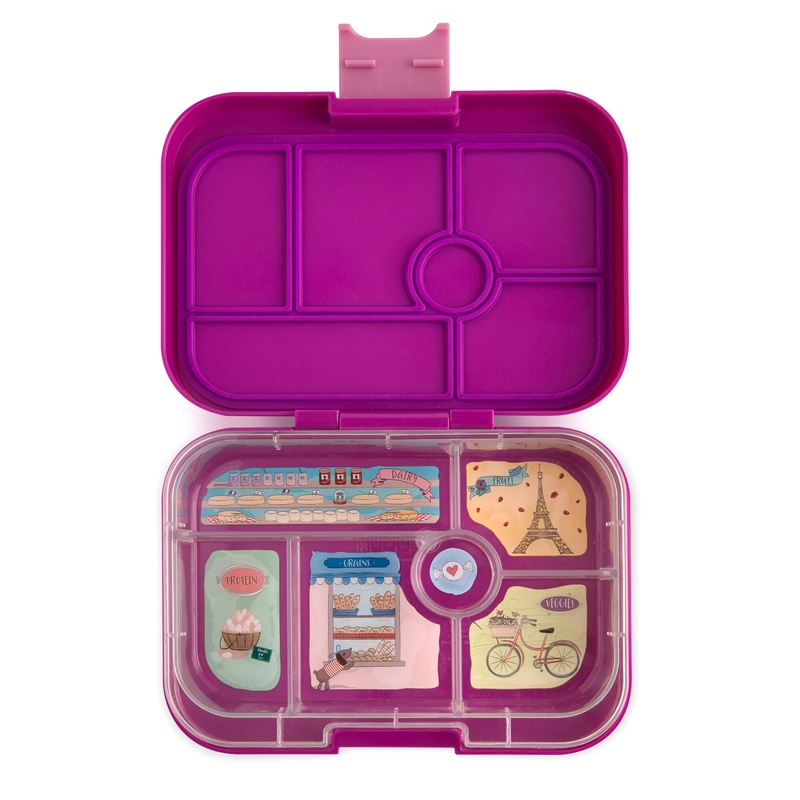 This classic Yumbox tray is divided into five ½ cup portions of the key food groups - Fruit, vegetable, grains, protein, dairy. Plus a small well for dip or a treat. Leakproof single lid: Pack yoghurt next to crackers with no worries! Yumbox's unique lid seals all food wells individually. Food won't touch or leak outside of the box. No need for plastic bags, cling-film or multiple lids (to lose!). Child friendly: Yumbox is sturdy and compact with an easy-open latch. It fits neatly into standard size thermal lunch bags. The Yumbox classic (fully filled) offers a nutritionally balanced meal for a child between the ages of 3 and 8. It is great for older children and adults for healthy snacks or for portion control. Think green: Reuse, reduce and save! Yumbox saves you money by eliminating the need for plastic bags, multiple containers, glingfilm and snack packs. With a Yumbox you can pack a waste free lunch. All materials used in production are food safe, BPA-free and phthalates-free. 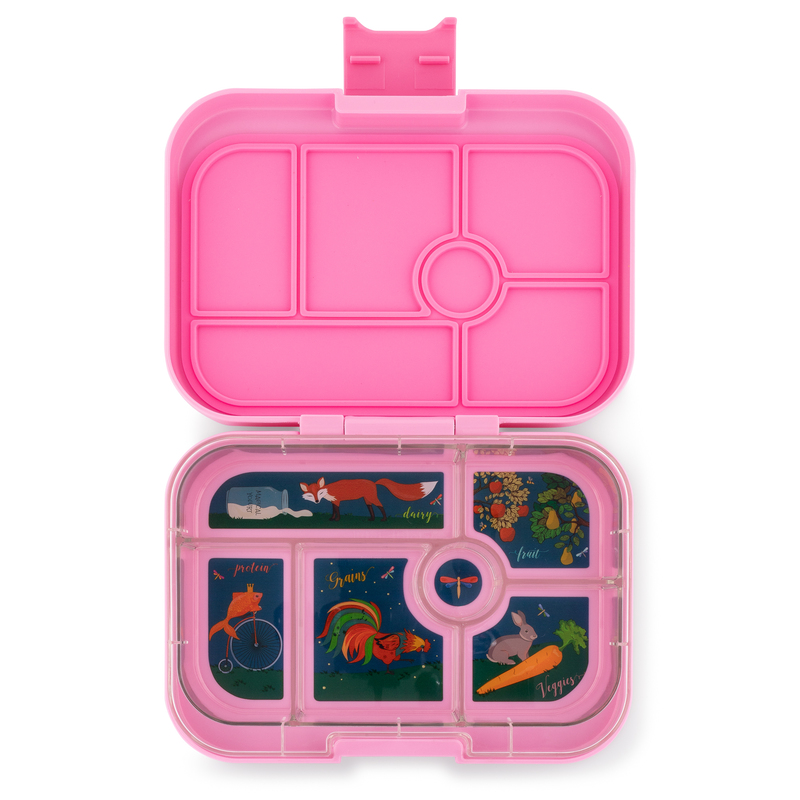 Educational & fun: The classic Yumbox is a great way to teach your child about portion sizes and different food groups. Offering a healthy variety of foods will instill good eating habits the fun way. Practical & fun to eat: Pack Yumbox for all meals on-the-go - school lunch, breakfast or lunch at the office, road trips, picnics and snacks. When you get home simply place the tray in the dishwasher, rinse out the outer box and you are ready for another adventure. All food-safe materials, BPA-free and phthalates-free. Sturdy ABS (outer box), Tritan(tray) and Silicone (seal). customer service was appalling, item arrived damaged. We have one for our little girl and it's fab. We have one for our little girl and it's fab.... Its easy to use - at school or road trips or even picnic. Also, is sturdy and compact with an easy-open latch. Nutritionally designed, leak-proof lunchboxes helping your food stay fresh throughout the day.